Electronic balances, digital balances, triple beam scales, electronic scales, weighing scales, mechanical scales, platform scales. WARNING: Proposition 65 Label for all scales and balances shown below. Ohaus Scout is an easy-to-use balance for laboratory and industrial weighing. Four buttons guide you quickly and easily through setup, unit of measure changes, mode changes, and calibration. Modes include weighing, parts counting, percent weighing, totalization, and more. Weigh in grams, kilograms, ounces, pounds, troy ounces, and five more units. Large backlit LCD display is bright and easy to view from a distance. ABS housing, stainless steel pan. Adjustable feet and leveling bubble. One second stabilization time. Auto shut-off prolongs battery life. Weigh below hook for density/specific gravity measurements. Overload protection up to 10 times of capacity. Battery or AC powered. AC adapter included. Outside dimensions 8" x 9" x 2" high. Readability is 0.1 grams. Weighs up to 610 grams (1 lb, 2 oz) or 2,610 grams (5 lb, 2 oz) with an extra weight set. 6" dia. stainless steel weighing platform. Detecto top loading mechanical dial scales. All four models listed below are a fixed dial design, with a convenient viewing angle. But the PT series scales can be ordered with a rotating dial instead of a fixed dial, and increments in grams instead of pounds. Both the PT and the T series scales are available in stainless steel instead of a baked enamel finish included on the four models listed below. 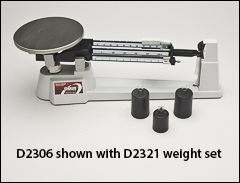 T series scales are available with a dual reading dial, displaying both kilogram and pound increments. Please contact us for a quote on any of these other available options. Please contact us if you are interested in receiving additional information about other available models of this style scale. 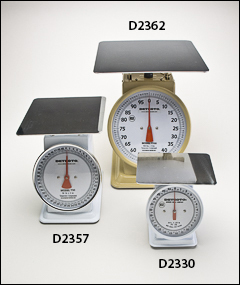 The PT series scales are available with capacities ranging from 16 ounce to 25 pounds. 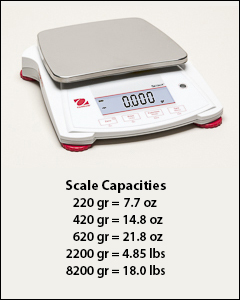 The T series scales are available with capacities ranging from 32 ounces to 25 pounds.